The Pennines were squeezed from the earth to form Britain’s backbone about 400 million years ago, give or take; the railways have been around for the blink of an eye. The former presented an inconvenient barrier when the latter was pushing its buffer stops to new destinations through the 19th century. 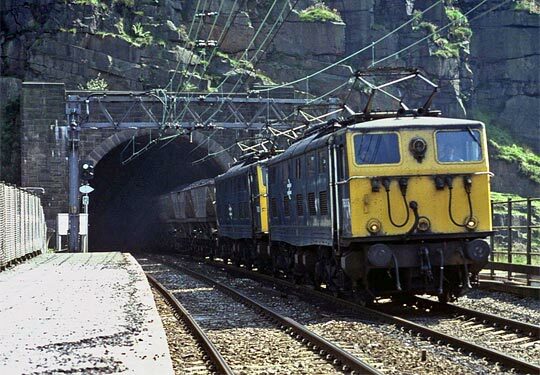 But it was a challenge that gave rise to the great trans-Pennine tunnels - Standedge, Doves Hole, Totley, Cowburn - linking the north’s valleys to usher in the age of the train. Whilst the first step on that adventure was taken by Summit Tunnel in the hills above Littleborough, following closely behind was an enterprise that pushed every boundary before eventually falling victim to the blind march of ‘progress’. 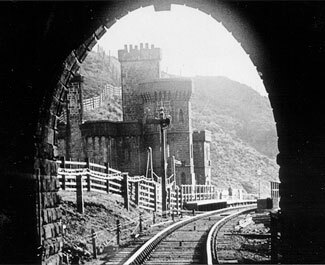 A classic view of the western portal as a train emerges from the 1845 tunnel into Woodhead Station. Railway promoters kept parliament busy in 1836, depositing more than a hundred bills for its consideration and approval. Amongst these was the Sheffield Ashton-under-Lyne & Manchester Railway (SA&M), led by Lord Wharncliffe, backed by 56 local bigwigs and guided by engineer Charles Vignoles. Over the course of that summer, Vignoles and Joseph Locke independently surveyed routes, coming together in October to reconcile any differences. Their joint plan involved a summit 966 feet above sea level at the eastern end of a tunnel stretching for over three miles. As an economy measure, this would be built to accommodate just a single track but with provision made for a second bore alongside it should the need arise. 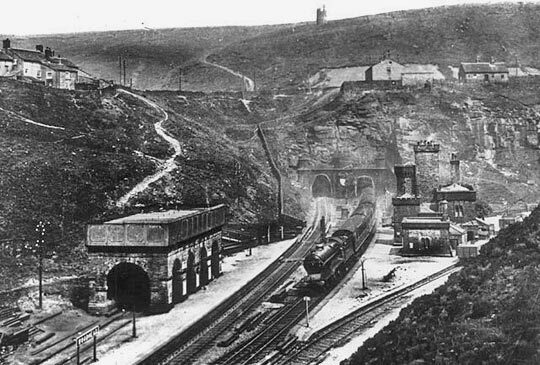 And so, on 1st October 1838, Wharncliffe’s spade broke the ground at the western end of what, seven years later, would become Woodhead Tunnel. This was a desolate place, in the back of beyond. Gearing up took many months. Accommodation had to be built for the workforce, stables for the horses, a magazine for the gunpowder; cart tracks were laid across the moor and machinery assembled upon it. It was the autumn of 1839 before real inroads were made. Progress benefitted from five construction shafts - 10 feet in diameter and taking upwards of two years to sink. The deepest plunged 567 feet into the millstone grit; the shallowest 405 feet. To haul out material and drive the pumps, a 25 horsepower steam engine was harnessed at each. The tunnel itself was offset from their base by 16 feet at its centreline so that the shafts would sit between it and the second bore, should one subsequently be added. From 12 working faces, the two headings were driven - one later forming the crown of the tunnel, with the other positioned below it. When all eventually met, the greatest inaccuracy in line and level was just three inches. 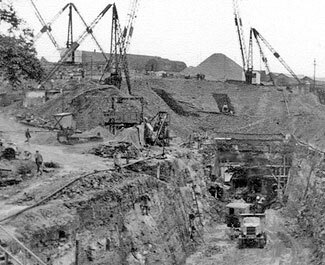 With this initial work fulfilled by 400 navvies under the SA&M’s employ, contractors were then appointed to complete the excavation and insert the lining - the greater eastern section being awarded to Thomas Nicholson, with Richard Hattersley allocated the remainder. When activities reached their peak, 1,500 men were said to be employed there; 32 of them didn’t survive the experience, 250 suffered serious injuries. 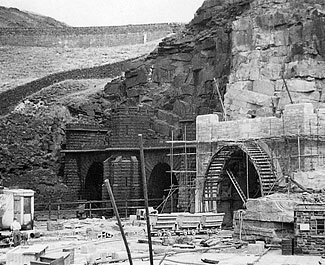 The castellated portal at the Woodhead end was dismantled as part of the 1960s' cable installation works. 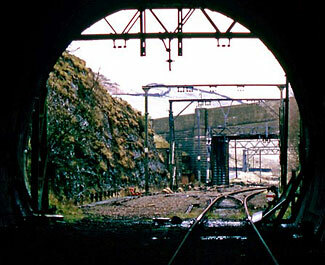 A rare view looking out of the original Down tunnel towards Woodhead Station. On Saturday 20th December 1845, the company’s directors and engineer accompanied General Sir Charles William Pasley, the Board of Trade’s Inspector of Railways, through the tunnel - their train propelling a wagon of torch-bearing men so that this £201,210 black hole could be closely examined. It was, Pasley declared, “one of the finest pieces of engineering I have ever seen”. Woodhead was visited by its inaugural revenue-earning service the following Monday. Two engines pulled 20 coaches through it in ten minutes, enjoying the falling 1:201 gradient from the eastern end at Dunford Bridge. They had passed beneath a soffit 18 feet above rail level; springing was at 10 feet. The lining varied in thickness from 18-36 inches - even more in areas of particularly weak ground - but was deemed altogether unnecessary for 300 yards where the millstone grit remained exposed. 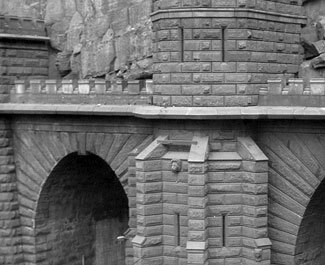 Two-foot deep drainage channels on both sides of the 15-foot wide bore carried away penetrating water whilst, into the north wall, 25 arches were cut at intervals of around 200 yards to ease the construction of a second tunnel. Cutting edge technology, in the form of Cooke & Wheatstone’s patent magnetic telegraph, allowed the guards at either end to communicate with one another. Every train to travel Woodhead’s single line was drawn by a lone pilot engine. This approach ensured that only one train could ever be in the tunnel at any time, so rendering a collision impossible. But it soon became a serious constraint on the route. With the line under new ownership - that of the Manchester Sheffield & Lincolnshire Railway - work to extend the arches to form cross headings got underway in the spring of 1847 and, from these, another tunnel was bored for Sheffield-bound (Up) traffic. It was a protracted if relatively mundane venture, with spoil removed via the passages to waiting wagons. But cholera stalked the navvies’ western encampment in 1849, claiming 28 victims in a matter of weeks. 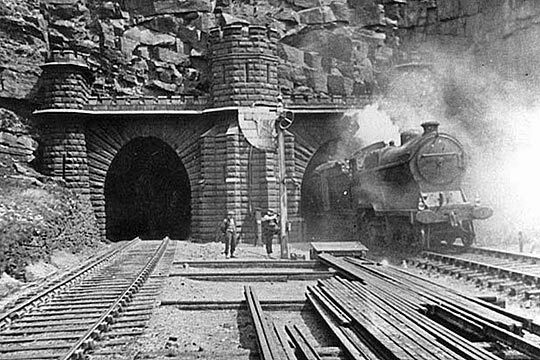 As 1852 arrived, the tunnel was receiving its finishing touches and deemed ready for inspection. But a 15-yard bulge had appeared in one of the side walls when Captain George Wynne of the Royal Engineers arrived to give it the once over on the 16th January; the masonry had to be taken down and rebuilt. He returned on 21st to find it “in a fit state for the conveyance of passengers” and the new Up tunnel was brought into service on 2nd February. In terms of dimensions, it was almost identical to its neighbour but lined throughout. S&T staff attend to a signal as a Down train finds daylight after its three-mile descent through the tunnel. By 1899 the Great Central had taken over and, to increase capacity, the company installed intermediate signals on the Up line, controlled from a box established in No.12 cross passage. Those prepared to man it - and there weren’t many - worked shorter six-hour shifts. But smoke contrived to mask the signals and many trains held by them found it difficult to get going again owing to the rising gradient. Conditions brought about the box’s abandonment in 1909. Hoping to improve matters, work to increase the diameter of No.2 shaft got underway in the autumn of 1912 - a £12,000 project that would take three years to complete. Conditions aside, there was no denying Woodhead’s success. An average of 80 trains daily - the majority of them carrying coal westwards or empties back to Yorkshire - made the journey through the hill. But their impact on the tunnels’ lining was severe, eroding the mortar holding it together. The route’s electrification had been given the green light in 1936 and, once hostilities with Germany had come to an end, a substantial programme of renovations was initiated, conducted within overnight and weekend possessions. The decline though proved too great. In 1946, the civil engineering department was granted nine-month occupations of each bore in turn - single line working was instituted through the other tunnel whilst some traffic was diverted via alternative routes. Even then, when these periods were over, it was realised that a more radical solution would have to be implemented to avoid a repeat of the exercise. A scene of great industry as the New tunnel's eastern approach cutting is excavated. Meanwhile the new portal takes shape at the west end. And so the foundations were laid for a new tunnel. Authorised by the Railway Executive on 15th November 1948, it would be built for two tracks to the south side of the original Down tunnel, separated from it by 77 feet except for the westernmost 200 yards where a curve of 40 chains radius reduced that distance to 27 feet. Unlike its elder siblings, the summit would be reached one mile in from the Dunford Bridge end, with falling gradients of 1:129 and 1:1,186 to the west and east sides respectively. Sir William Halcrow & Partners were appointed as designers and consulting engineers, the construction contract being let to Balfour Beatty. Directing the venture was Eastern Region’s Chief Engineer John Campbell whilst the resident engineer was J D Dempster. In February 1949, the hills became alive again to the sounds of industry. Dunford Bridge Camp grew for the workforce of 1,100, complete with cinema, clubs and a Post Office. There was a proper sanitation system too. But this was not the manual enterprise witnessed a hundred years earlier; this time a new generation of plant and equipment would cut timescales and costs. Or so everyone thought. 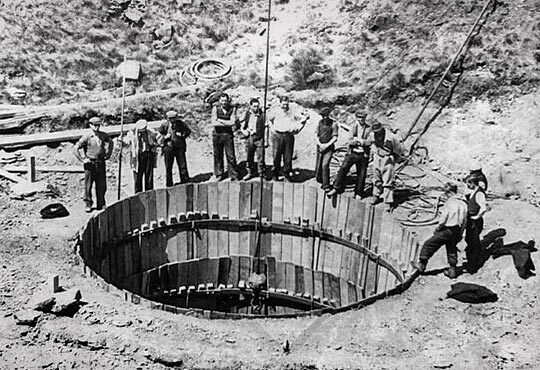 The engineer’s plan for three construction shafts was changed in favour of the contractor’s proposal for just one - 16 feet in diameter and located 2,610 yards from the Woodhead end, about 60 yards west of the midpoint. On the surface, this coincided with a shallow valley, reducing its depth to 467 feet. It was sunk 26 feet south of the centreline, thus separating lifting operations from those taking place in the tunnel itself. From its base, 12-foot square headings were thrust in both directions to meet those advancing from the portals. The rock was displaced with gelignite; side-tipping skips hauled by battery-powered locomotives carrying the spoil away for disposal. The 'New' tunnel was driven from its ends and a single central shaft of 16 feet diameter and 467 feet in depth. The plan was to enlarge the heading to full section by means of radial drilling. This though had to be abandoned as the shaly nature of the millstone grit - through which three-quarters of it was driven - brought uncontrollable results, with considerable overbreaks. A hasty reorganisation of the work was required, allowing it to progress from more than the four faces. But this in itself created logistical difficulties and the rate of progress slowed to a fraction of that demanded by the programme. Then, in 1951, two sections collapsed, one of them - 300 yards from the Woodhead end - left a void reaching 70 feet into the roof. Work there was delayed for six months. The consequence though was the provision of haulage ways parallel to the heading and connected to it at intervals, these extending for around two miles. They effectively brought salvation - allowing nine additional working chambers to be opened up and, with them, the default installation of steel reinforcement ribs as the full excavation progressed. Whilst this proved costly and caused much consternation amongst the bean counters, it prevented the Pennines from falling on anyone’s head. At 3 miles 66 yards, the new tunnel was 131 feet longer than its neighbouring single bores. Lined with mass concrete not less than 21 inches thick, its horseshoe shape provided a span of 27 feet and height from rail to soffit of 20 feet 7¼ inches. No invert was needed. To help ventilate the summit section, an 8-foot diameter stope was bored, 1,205 yards from the Dunford Bridge end, to connect with the easternmost (No.5) shaft of the Victorian tunnels. To improve the lot of future maintenance teams, a mess room was provided at its midpoint and permanent lighting installed. 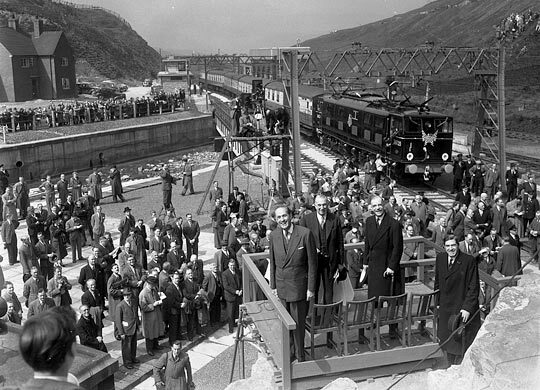 The great and the good gather at the Woodhead end for the New tunnel's official opening on 3rd June 1954. Completed in October 1953, Woodhead New cost £4.25 million - £1.8 million over budget - and six lives. The first trains to pass through under 1,500V DC electric traction did so on 30th May 1954, with regular workings getting underway a fortnight later. Alan Lennox-Boyd, Minister of Transport, officially cut the ribbon on 3rd June. In January 1964, consent was granted for a new 400kV electricity transmission line between Thorpe Marsh near Doncaster and Stalybridge. Supported by others, the Peak Park Planning Board successfully argued that the infrastructure should be below ground between Dunford Bridge and Woodhead. 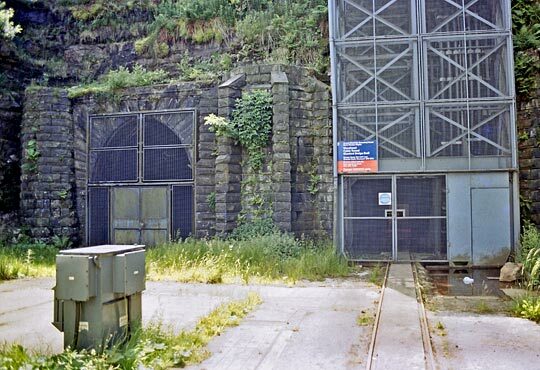 To that end, the Central Electricity Generating Board acquired the two Victorian tunnels. But preparing them for a new life would involve considerable works so, in order to meet immediate demand, the Board was permitted to install temporary cables over the hill. Since the late-Sixties, the Up bore (right) has accommodated electricity cables whilst the Down tunnel (left) contains oil tanks.. In the Up bore, thick soot was blasted away with air jets and mixed with ballast, cement and lime to create a hard floor. Voids behind the bulging lining were grouted and huge areas repointed, amounting to about half the tunnel. Three of the shafts were backfilled and sealed whilst No.5 had rubble dropped to a height of 40 feet, below the level of the stope. But shaft No.2 - having already been widened to 16 feet in diameter - was also repointed and retained in case of future ventilation needs. Slightly younger and continuously lined, the Up tunnel was chosen as host for the cabling which was insulated within oil-filled pressurised tubes and immersed in a water trough. Alongside it, a narrow gauge railway was laid for access purposes. Next door in the Down tunnel, oil tanks were fitted. The portals, delightfully castellated when built, were reshaped to make way for ducting. Following an investment of £2.75 million, the switch was thrown and Woodhead’s two electrical circuits went live in 1969. Whilst envisaging a bright future for the Woodhead line as a conduit for freight, Richard Beeching’s 1963 ‘reshaping’ report effectively triggered its downfall. Amongst the list of proposals was the withdrawal of Sheffield-Manchester passenger services from the Hope Valley route. When the Minister of Transport refused to approve this, attention turned to services via Woodhead which served fewer communities. British Rail’s intention to sever them prompted an outcry and an enquiry, but its decision was eventually upheld and the last scheduled passenger train made its way through the tunnel on 4th January 1970. Then goods traffic, also dwindling, came under scrutiny too. Just 27 years after the new tunnel opened, a Harwich ferry train emerged from it as dawn broke on Saturday 18th July 1981, despatching into history the most audacious part of Lord Wharncliffe’s railway. On 25th July 1980, 76008 and 76021 head west with coal. Campaigners still worked for a reprieve and, for several years, a rusting single track ventured through the open entrances to the tunnel. But it was lifted in 1986, extinguishing all remaining hopes. 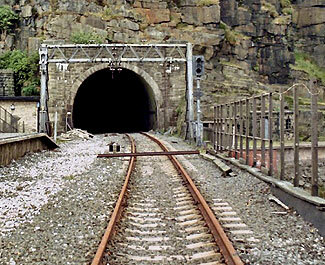 Two years later, a collapse near the midpoint of the original Down tunnel and concerns about ongoing maintenance costs prompted the CEGB to add the 1954 bore to their estate; this was acquired in 1993, reputedly for £1 - the intention being to fit new cables in it when the existing ones became life expired. In the meantime, ‘running repairs’ were carried out to the single bores with cavities grouted, more pointing, buttresses and steel ribs installed, and some sections lined in concrete. The costs were considerable, amounting to £15 million. Then in 1990, a stop-joint fire in the Up tunnel caused extensive damage, six years after which an oil fire occurred in the Down. The incentives to move next door were mounting up. ...and three miles further east emerges at Dunford Bridge. With the remaining trans-Pennine lines becoming victims of their own success, the railway’s strategic planners were tasked with finding more capacity to satisfy medium-term demands - both passenger and freight. Whilst they focussed on existing routes, campaigners and business leaders pointed at Woodhead. With a potential conflict brewing over use of its tunnel, the National Grid sought advice from the Department for Transport about the likelihood of the railway returning. There are no plans, it was told. The ensuing political wrangle fizzled out and preparations for the installation of new cables got underway in early 2008. Once live, the Victorian bores were decommissioned and had their ends unceremoniously filled with concrete, condemning these historic structures to abandonment. Predicting the future is a talent few are able to perform with any degree of certainty, particularly in an era of economic turmoil and rapid technological development. The case for Woodhead’s revival could grow ever stronger or sink without trace. From a freight perspective, the 16-mile gap between Penistone and Hadfield is perhaps a side-show given that the logical connecting routes - via Tiviot Dale and the formidable Worsborough incline - have also been lost. 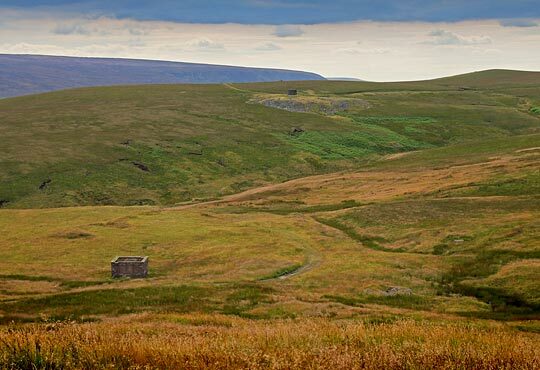 If accepted, Network Rail’s Northern Hub strategy will deliver much needed capacity for passenger services and possibly restore the tracks through two other disused Victorian bores, those at Standedge. Whatever the prospects for the three tunnels at Woodhead, there can be no rewriting of their past. The first one was engineered against the odds; the second overcame disease. A century later, the third was caught between a rock and a hard place. All three represent tenacious victories over the forces of nature, rightfully securing prominent entries in the railway’s history book. The view looking west from the site of Observatory No.3. Bottom-left is the shaft to the 1954 tunnel; bottom-right is a pile of brickwork that used to be Shaft No.3. Near the horizon is Shaft No.2 and its associated spoil heap.